Danang pancake is neither too small nor too big, but only in a medium sized. 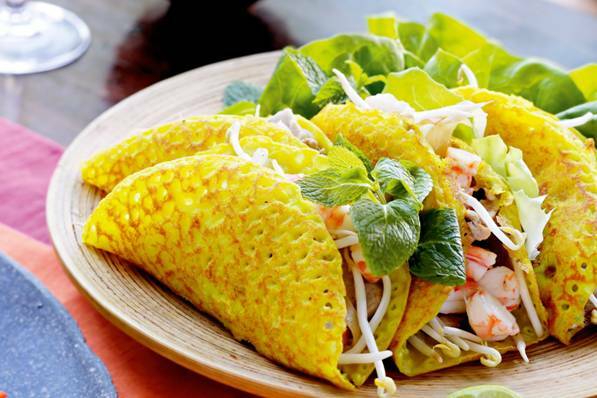 Da Nang pancake is made of milled rice flour with egg yolks and added turmeric powder, casted on a hot pan. Fillings are also specially selected, only made from alive shrimp, bacon (half fat and half lean), fresh soya bean sprouts. Clean vegetables, including lettuce, basil, green banana, green mustard... Dipping sauce made from pig liver and grinded tofu create a meaty and delicious sauce, next to a cup of chili and garlic fish sauce made in traditional way. This rustic and simple cake from ingredients to the taste is the great allure for both natives and tourists to Da Nang. 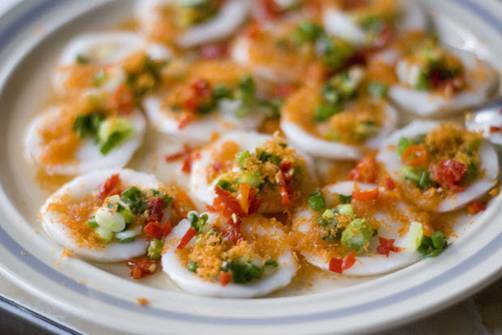 Only one name, but there are so many kinds of savoury rice cake distinguished by shape and ways of eating. Ear Savoury Rice Cake (Water Fern Cake) is served available on the dish, cups Savoury Rice Cake is prefabricated in small round bowls. And all kinds of fern cake have attractive filling on their top. Fillings are made from marinated finely chopped shrimp or fish, and dried on charcoal to remove fishy smell. Or, it is made from lean meat, mushrooms... which create a thick mixture with an eye- catching bright orange color. Savoury rice cake is served with fermented pork rolls, beef dumplings. However, whether is the cake delicious or not is decided by the sauce served with it. The sauce just includes minced garlic and chili sauce diluted with cooled boiled water and added some lemon and sugar, but it is very suitable for this kind of white, soft cake. Coming to Danang, sitting around a street stall, eating savoury rice cake and slurping the sweet sauce with fresh lemon flavor is really interesting! You can find the savoury rice cake steamed thin rice pancake stalls in any streets, alleys in the city and in restaurants and hotels. Apart from the street vendors, the savoury rice cake section in Con market (entrance to Hung Vuong street), Hoang Dieu, Hai Phong, Ong Ich Khiem (serving from noon, only from September to February annually) streets ... are the places for you to try. Each bowl is only about from VND 1,500. 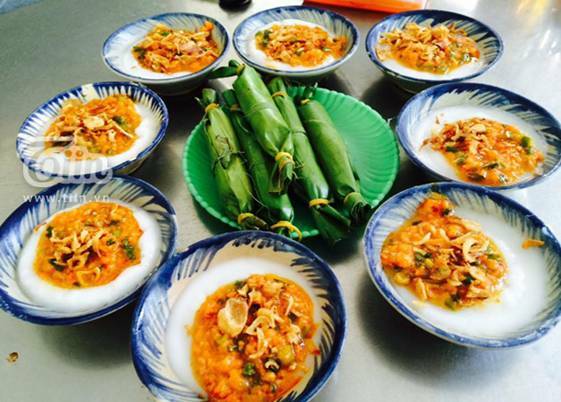 Visiting Danang in any season of the year, you have the opportunity to enjoy this special dish. Sucking snails, spicy snails are the rustic names Danang people give to snails fried with chili and citronella dish. Small edible snails, medium- sized edible snails, bitter snails... are chosen carefully, soaked, washed and drained, then fried with chili, spices… The recipe has nothing special, but the taste is charming and tasty. 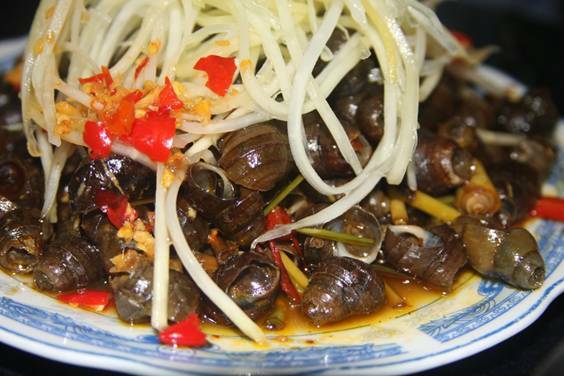 Some addresses for you to enjoy delicious sucking snails in Danang: “Dia bay (UFO) sucking snail” restaurant on 2-9 road, Yaua Village (at Tran Thi Ly bridge pier), Mr. Ha restaurant (Con market)….